On Fridays, J Warner Wallace, a cold case homicide detective, posts a weekly podcast. Here is the link to his website. You can find his podcast page, too. Last week’s podcast (28 Feb 2014) he was explaining how to think about our doubts. He provided a distinction that was clear and helpful and easy for me to grasp. I gravitate toward distinctions because they are a hook for comprehending a concept in a way that I can store somewhere in my mind. People are motivated to doubt in one (or more) of these 3 ways. In shorthand, he says we doubt for RATIONAL, VOLITIONAL or EMOTIONAL reasons. A logical Joe or Jane, when confronted with these different sources of doubt, will quickly see that deciding to doubt on the basis of reasons or evidence is the only legitimate choice. But I certainly respect someone more if they honestly say something like, “Agreed that I have no good reason to doubt the safety record of airplanes, I just don’t WANT to fly. I don’t want to have to deal with my fear or anxiety”. That brings up the meaning of the term ‘reasonable’. What do YOU think is the hinge for defining ‘reasonable’? It has to do with REASON. Is there sufficient credible evidence to back the conclusion? Of course there are always ‘possible’ explanations. But we can’t live like that – on ‘what about, or what if this or that??? In life we frequently make decisions based on what we determine to be sufficient evidence. There really is no certainty in life. Is there an actual life event-type REASON to be discouraged? 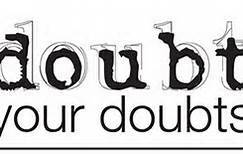 Question: What’s the first topic of doubt or discouragement in your life that comes to mind? Can you begin to determine WHY you doubt that something or are discouraged?